George Lamming is a highly respected West Indian novelist, recipient of the Somerset Maugham Award for Literature, and a Fellow of the Institute of Jamaica. He was born and raised in Carrington Village, Barbados, the setting of his first and best-known book, "In the Castle of My Skin". 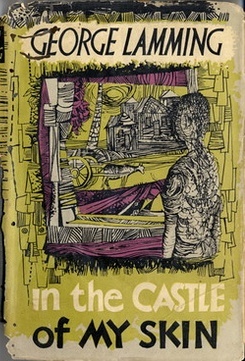 This autobiographical novel is considered a seminal work in post-colonial fiction - the title is taken from a poem by Derek Walcott: "You in the castle of your skin, I among the swineherd". "In the Castle of My Skin" is the personal story that 'came out of the gut'. It also deals with a broader issues of imperialism, class, racism, economics and education. The novel is set during the riots of the 1930s, and is cleverly told from three perspectives: the young first-person narrator known only as G. (the mouthpiece for Lamming himself); third-person voices of Ma and Pa, and an omniscient third-person narrator. Lamming has a rhythmic, musical style, and a firm grasp of the local dialect. His writing was influenced by Thomas Hardy, Joseph Conrad, Jane Austen and the King James Bible. Just as George Lamming himself had to travel to England for educational and employment prospects, so G. also had to separate from his family and peer group and try for a better life in the 'mother country'. The book ends on a sad note, as G. id bidding farewell to Pa.
"In the Castle of My Skin" gives a powerful, clear and sometimes disturbing picture of Barbadian life in the 1930s, a must-read for anyone interested in the history of this fascinating part of the world. Before moving to England, George Lamming worked from as a teacher in a boarding school for boys in Port of Spain, Trinidad. Later he emigrated to England where, for a short time, he worked in a factory. At the beginning of 1950s he became a broadcaster for the BBC Colonial Service. 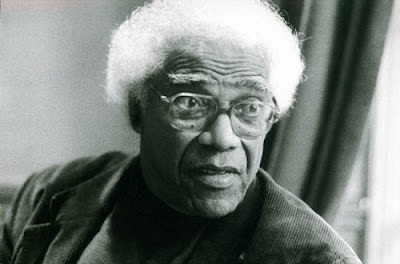 His writings were published firstly in the Barbadian magazine Bim, edited by his teacher Frank Collymore, and the BBC's Caribbean Voices radio series broadcast his poems and short prose. Lamming himself read poems on Caribbean Voices, including some by the young poet Derek Walcott. He started his academic career in 1967 as a writer-in-residence and lecturer in the Creative Arts Centre and Department of Education at the University of the West Indies, Kingston (1967–68).Since then, he has been a visiting professor in the USA at the University of Texas at Austin, the University of Pennsylvania, and Brown University, and a lecturer in Denmark, Tanzania, and Australia. In May 2011 the National Union of Writers and Artists of Cuba (UNEAC) awarded him the first Caribbean Hibiscus Award in acknowledgement of his lifetime's work. In April 2012, he was chair of the judges for the OCM Bocas Prize for Caribbean Literature.